Upper River: With warmer temperatures the past few days, we are seeing the beginning of runoff, with flows on the rise and clarity in the river greatly reduced. The upper river is the best place for decent water clarity but is likely to be limited to one foot of visibility. Nymphing or streamer fishing the edges on the upper river are generally the best tactics, but fish will take attractor dry flies during non-hatch periods as well. Conditions are best above the Lake Creek confluence. Middle River: Cooler overcast weather last week allowed us to maintain fishable conditions through Saturday, but we are now looking at spring runoff following the warm clear weather of the past week. Conditions have gotten worse, with water clarity dropping to around one foot of visibility. At current flows, the river is still fishable along the edges, but do not step where you cannot see the riverbed. Lower River: Fishing has been good with strong action on stonefly nymphs and streamers. In Bighorn Sheep Canyon, the fishing was more focused on appealing to the opportunistic nature of brown and rainbow trout, putting big nymphs and streamers into the fish's feeding window. Look for fish to move out of the increasing water velocity, taking up shelter in protected lies along the edges. Trout fishing from shore and boat remains good at Clear Creek Reservoir. Anglers are mostly catching 8 - 12 inch rainbow trout with the occasional 18 - 25 inch rainbow trout being landed as well. At the boat ramp parking lot area, shore anglers experienced success using Tasmanian Devil lures with a red and green color pattern. Bait anglers fishing from shore caught several trout on PowerBait and Fire Bait. The northwest part of the reservoir remains the most productive area for fly fishermen. Fly anglers found the most success with olive colored woolly buggers. Streamers and red San Juan worms were also productive flies. The best trout fishing from a boat has been near the inlet and northeast part of the reservoir. Joe's Flies spinners, yellow colored Rapalas, brown trout pattern Rapalas, and Tasmanian Devil lures were the best trout lures to employ from a boat. Boat anglers also landed trout by fishing the lake bottom with PowerBait. Kokanee salmon fishing has been very slow. A squid tipped with white corn is one of the best methods to land kokanee salmon at the eastern part of the reservoir. At the northeast part of the reservoir, one angler reported a large tiger musky striking a Rapala. The reservoir is closed to trailer motorized watercrafts on Tuesdays and Wednesdays. The current boating hours are from 6 a.m. to 8 p.m. Crystal Lake continues to offer anglers good fishing from both shore and belly boats. Most anglers are having success using assorted flies. Some anglers using lures are also having success. Fishing at Forebay Reservoir is fair. Anglers are reporting mostly rainbow trout and a few lake trout being caught. Anglers are using assorted baits, lures, and flies. The fishing has been steady this spring at Frantz Lake. There are reports of success with smallmouth bass recently. Be sure to target bass with specific lures. Bait fisherman are having luck along the south shore with green and yellow PowerBait. Lure fisherman have had success with silver spoons. Hayden Meadows Reservoir continues to have good fishing with assorted baits, flies, and lures. The reservoir is currently at 211,000 acre feet and the water temperature is warming to about 61 degrees. 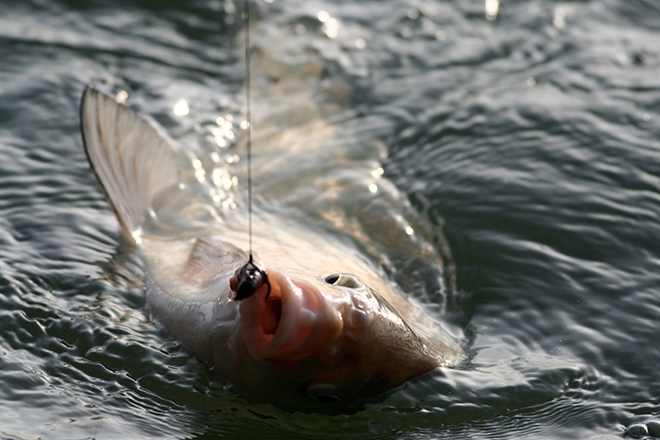 We have had many reports of anglers catching white bass and small wiper on the reservoir in large quantities. Most are smaller fish with a few reports of fish 16 - 18 inches being caught all over the reservoir on a variety of lures. We still have not heard of many walleye or saugeye being caught on the main reservoir or the stilling basin. Fishing at the stilling basin and Lake Hasty is picking up with some reports of catfish being caught on worms and chicken liver below the dam. Spring fishing conditions at Lake Pueblo have been hit and miss on the shore. The west end of the lake has thawed and is fishable. Flows below the dam on the tailwater have increased, as winter water storage has ended. Water is being released to make additional room for runoff, which is just around the corner. Fishing has been good on the tailwater for trout. Even with the increase in release, flows are still relatively low and the river is still manageable for wading. Anglers are reporting success on blue winged olive and midge patterns. Get to the river early to avoid the crowds, especially on days with nice weather. The largemouth bass are currently in pre-spawn mode. Anticline Ponds and Valco Ponds are also a good place to try, as fishing for pan fish and trout have been productive. Trout fishing continues to be good with anglers using various lures, hard baits, and PowerBait. Bass are being caught as well as some smaller crappie. The catfish bite has slowed for the time being. The road to O'Haver Lake is open along with the forest service campground. The fishing has been fair with success using worms and salmon eggs. Rooster Tails have been effective for lure anglers. Fly anglers have reported some success with copper johns. Anglers willing to bring a self launched boat or float tubes generally have more success. The fishing pressure at Riverside Ponds is typically less than the other lakes near Salida. Fly anglers will often fish the ponds along with the adjoining Arkansas River. This spring, fly anglers have reported success with various nymph rigs. Successful bait fishermen have used worms and salmon eggs. Silver spoons have been effective for spinner fishermen. The fishing for smallmouth bass has been slow so far this spring. The lake is completely open, although the Matchless boat ramp is not open due to low water levels. The fishing from shore is really good for both rainbow and lake trout. Anglers are catching fish on assorted baits, lures, and flies. The boat ramp at Twin Lakes is now open. Fishing from boats has been fair, for both rainbow trout and lake trout. Fishing from shore is starting to pick up, especially near the power plant. Anglers are reporting lake trout being caught from shore with both sucker meat and PowerBait.